If you want a chance to get to know the major landscaping companies in Cleveland, Ohio, make sure you spend a day or two at the 2013 Great Big Home & Garden Show. 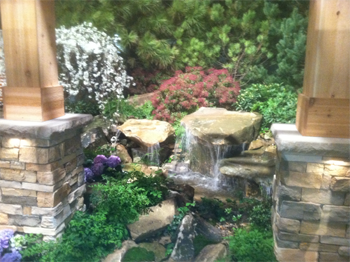 You could spend hours and hours on the phone interviewing different landscaping companies in the Cleveland area and not get as much information as you'll get when you walk through the feature gardens at the show and talk with the companies' representatives. This year, the theme of the feature gardens is U.S. Landmarks. Cleveland's best landscaping companies have chosen American landmarks to base their gardens on. You'll enjoy walking through the gardens, getting ideas for your own landscaping, and talking with local experts. Here's an overview of the gardens you'll see at the Great Big Home & Garden Show. Longwood Gardens, Pennsylvania. A horticultural landmark created by the du Pont family, the Longwood Gardens have been inspiring landscapers since Victorian times. This garden features a glass structure, natural stone walkways, entryways, and appropriate garden plantings. Ida Cason Callaway Memorial Chapel, Georgia. Auburn High School's Landscape Horticulture Program has designed a beautiful feature garden with bluestone walkways, a reflecting pond, and a chapel facsimile built by the high school's Construction Technology students. Cedar Point, Ohio. Established in 1870, Cedar Point has long been the inspiration for many landscapers in the Ohio area. The beautiful gardens interspersed among the roller coasters and other attractions have been admired for many generations. This feature garden will transport you to another era. Beverly Hills, California. The focal point of the Beverly Hills feature garden is, of course, a swimming pool. If you've been thinking about installing a pool in your backyard, you'll get excellent ideas from this feature garden. The Biltmore Estate, N.C. America's largest home, the Biltmore Estate, is surrounded by impressive gardens to match. Like its inspiration, the feature garden is private but formal, and it features natural arbors, azaleas, and rhododendrons, as well as stone walls, a sandstone patio, and a hidden water feature. Napa Valley, California. When you think of Napa Valley, think of relaxation, rejuvenation, and restful scenery. Then imagine how you can bring those attributes to your own landscaping. Get ideas from this feature garden, which features graceful villa arches, a wine-tasting courtyard, flowering trees, and a soothing water feature. Shenandoah National Park. Our very own 2013 feature garden is inspired by Shenandoah National Park . It includes a rustic pavilion, natural waterfall, woodland campsite, and a seat wall inspired by the stone guardrails along Skyline Drive. We hope you'll stop in and say hello as you enjoy the beauty of Shenandoah National Park. Las Vegas, Nevada. Along with the river rocks, stones, and desert-inspired garden, you'll get a chance to try your luck at the Las Vegas themed garden. You'll see six working slot machines and a 1926 Model T Street Rod. Sonoma Valley, California. When you see dozens of shades of pink, you'll know you've arrived at the Sonoma Valley feature garden. Look for the bell tower and wine pavilion, which features a tasting bar. Augusta National Golf Course, Georgia. America's iconic golf course inspired this feature garden. It includes signature elements like an arched bridge over a gentle stream, a yellow primrose map of the country, and a multi-level water feature. Great Wild West. Explore America's most rugged landscape in this unique feature garden. Learn about ways to use cacti and raised brick patios to create a rustic, dynamic landscape. This garden also includes two walk-through log cabins. We hope you'll find lots of inspiration in the feature gardens at the Great Big Home & Garden Show.